So here's a special square of tiles to walk on! 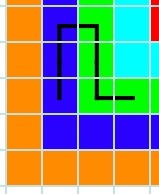 The black square in the middle contains some very special prizes. You can get the prizes by collecting tokens which are on each tile. So you have to step on as many tiles as possible. You cannot go onto any tile more than once. You are not allowed to step on more than two tiles of the same colour one after another. So this path would be OK.
Why? 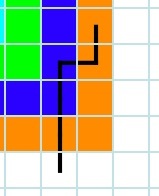 Because the path goes along $3$ blues which is not allowed, the blue to green is OK but then there are $4$ green tiles one this path next to each other and that is also not allowed. 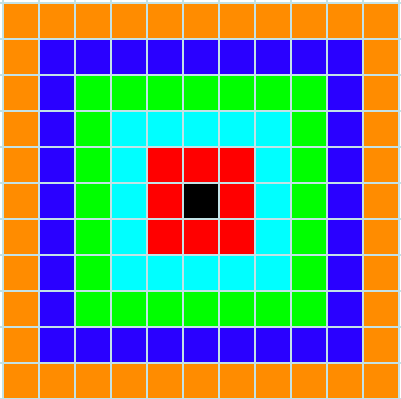 Your challenge is to find a path from anywhere on the outside of the square to the black square in the middle, following the rules above and trying to step on as many tiles as possible. Creating and manipulating expressions and formulae. Generalising. Visualising. Games. Factors and multiples. Odd and even numbers. Addition & subtraction. Mathematical reasoning & proof. Interactivities. Working systematically.